First, you really get the sense that Isabella and Juan Carlos (on the cover) are searching. They are treading into completely new territory, emotionally and physically in Calusa Spirits. In the image, Isabella retains her trademark focus, ready for battle. Juan Carlos is behind her, but he is not passive. He’s searching too. I think readers will really get the sense they are a true couple, partners. In fact, while their journeys are rocky and full of traps–some really exciting escapes are necessary in this installment just to survive–an important sub-theme is how they come together as a couple, more than romantic partners. The last scene in fact has a pretty dramatic twist that hinges on which direction their relationship goes. We see this unfold in the story, but the cover art really conveys elements of this, too. Second, the pirates are on land. This becomes a critical part of the plot (as it did in Tortuga Bay). As you can tell from their expressions, they are unsure if they are landing in friendly or hostile territory. Hint: This is South Florida in 1781, so you can bet it’s not friendly territory. We have seen some transition from mostly seafaring and high-seas pitched battles to more action traversing land and sea. The same momentum carries through in Calusa Spirits. 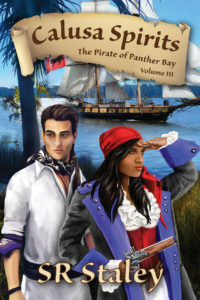 Third, the imagery itself is full of the Pirate of Panther Bay’s legacy as well as the future. The river in the background? That’s the Wakulla River at San Marcos de Apalache where it merges with the St. Marks River south of Tallahassee. A few critical plot points happen at this very spot. While writing the scenes, I sat at this very site amidst the ruins of the fort (which is a state park now) and imagined the scene unfolding around me. The ship in the river? That’s an image of the working brig U.S.S. Niagara, the ship I modeled Isabella’s pirate brig after. She is actually docked at the Erie (PA) Maritime Museum, which is a fantastic site. I visited the museum and got a great deal of inspiration for the series the Isabella’s life on board ship. You can take a virtual tour here and put the War of 1812 ship into the context of Isabella, Jean-Michel, and Juan Carlos’s exploits in the 1780s. And yes, the Maree Rouge would be able to anchor at this point the Wakulla River (but not the St. Marks). This would be the northernmost point it would have been able to do this. Alas, we didn’t get Calusa Indians on the cover, but the imagery is as illusive as the rogue tribe they meet up with. The cover scene could just as easily be further south on the Caloosahatchee River back in those wild days of untamed Florida. So, that’s the story behind the cover of Calusa Spirits! I am very excited to have brought Isabella and her crew to the Gulf Coast of Florida. After a treacherous stop in South Florida and the Everglades, she makes it up to St. Marks (where once again everything seems to be near the brink of disaster). Calusa Spirits is on pre-order now with a September official launch date. You can check it and the previous books out at SYP Publishing’s page or at my own website.